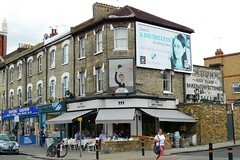 Gastropub on Northcote Road in Battersea/Clapham, part of a small but growing chain. This one opened in October 2009, replacing a Pitcher & Piano. Like the other branches, they serve real ales as well as other interesting beers from around the world, and the draft beers are available in thirds as well as halves and pints. They have handled jugs as well as straight glasses. There's some seating out the front. Inside, the front part of the pub is dominated by the bar, and is standing-room-and-bar-stools only. An open kitchen separates this part from the back room, which seats around 35 people on some very comfortable banquette seating as well as normal chairs and tables. Note that the back room is often reserved for diners — on our August 2010 visit there was no restriction on sitting in the back room during the late afternoon/early evening, but when we returned a few hours later (around 9pm) the mostly-empty back room was diners-only even though the front bar and outside seating area were packed. Kake visited on a Wednesday early evening in August 2010. It was mostly empty when I arrived a little after 5:30pm, with only a couple of other customers (though as mentioned above, it was packed by 9pm). There were three real ales on; Sambrooks Wandle, Nethergate Mild (£3.40/pint), and Wolf Brewery Wolf Ale (£3.40/pint) — the two I tried were fine. I also tried one of the bar snacks; boquerones with gremolata and crostini (£4.50). This was a very satisfying snack, eight vinegary anchovies with a small, zesty bowl of gremolata and some nicely thin and crispy crostini. According to the Draft House website as of September 2010, food is served during all hours the pub is open. Music was playing throughout my visit — retro, jazz, and country. Accessibility: A small step up to get in. Last visited by Kake, August 2010. Opening hours taken from the Draft House website, September 2010. Last edited 2015-08-27 17:22:18 (version 6; diff). List all versions. Page last edited 2015-08-27 17:22:18 (version 6).